These tofu skewers are the best way to make everybody enjoy tofu. Perfect for BBQ, you can also bake them if you prefer. I suggest using extra-firm tofu and not overcooking it. In a bowl, combine soy sauce, maple syrup, liquid smoke and chopped garlic. Add the tofu and let marinate in the refrigerator for 60 to 90 minutes, or cover and refrigerate overnight, turning occasionally. Drain the marinade into a saucepan, bring to boil and simmer until it thickens. 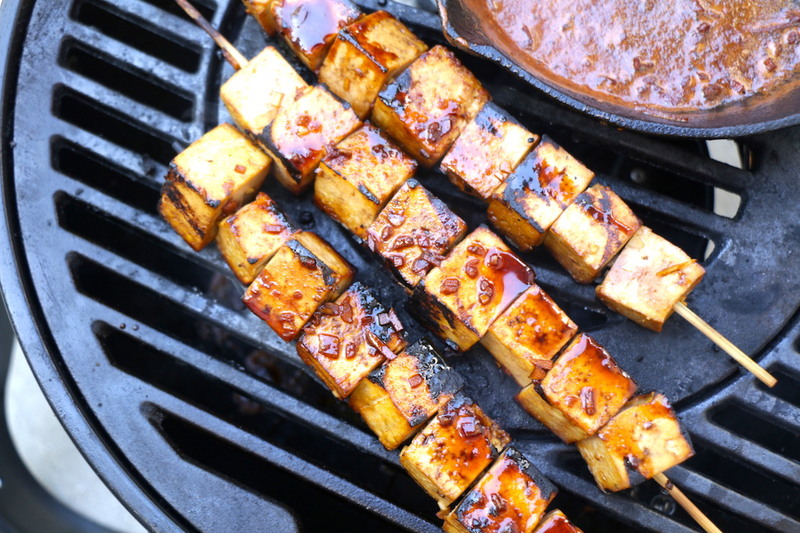 Thread the cubes of tofu onto skewers. Lightly brush the skewers with oil( do not use too much oil since it can burn on the BBQ and becoming toxic). Grill the skewers for 3 minutes on each side and brush with the marinade. Serve garnish with green onions and pass the remaining sauce. Place the skewers in a baking dish. Pour the marinade over the skewers and bake for 30 minutes, flipping once halfway through cooking. Tofu skewers. Vegan steak. Guess it is time to go out and buy a grill. Thank you for the recipes!!! Allergic to soya, so can’t do tofu, but made some using the sauce, (Worcester sauce instead of soy) small mushrooms, bits of red pepper, onions, etc etc, whatever was in the fridge. Works just fine. Thanks for a great recipe. Teriaki sauce doesn’t contain gluten! Making this tomorrow for some friends who are coming around for a barbecue. Thank you for the *amazing* recipes you provide here! Thanks for that, but vegan Worcester sauce was what I had, so it had to do. Seitan could have subbed for the tofu, but didn’t have any of that, either! Pensioners can’t afford to have well stocked cupboards! Don’t suppose you’d consider publishing a (cheapish!) book of these recipes, would you? I don’t take my laptop into the kitchen, because I don’t want to get sticky fingermarks all over it, which means I have to write everything down before I start! Incidentally, it’s soya, not gluten, that I avoid. Tofu is made from soya beans. Soya is inflammatory for some people, and I’m one of the unlucky ones. You don’t realise how many products have soya in them, until you try to avoid it! Love the flavor and ease of this dish!